A new campaign launched recently by Brazil’s Pediatric Society of Rio Grande (SPRS) has caused quite a stir amongst breastfeeding advocates and mothers, and with good reason. The campaign is meant to educate women about the potential influence pregnant (not breastfeeding) mothers’ diets can have on their childrens’ health. However, the campaign is misleading. It shows babies suckling from breasts illustrated with unhealthy food such as fizzy drinks, burgers and doughnuts. Such images create the illusion that breastfed babies consume unhealthy food directly. This is far from the truth. A breastfed baby gets so many important factors from breastmilk. Indeed, how a baby is fed is associated with various health outcomes. Breastfeeding is important for mothers and their babies, regardless of the mother’s diet. Sure, there are probably differences between the breastmilk of a mother who has a highly nutritious diet as opposed a ‘lousy’ diet. But this has to be put into perspective, especially since not breastfeeding increases the risk of various health outcomes for mothers and their babies. For example, not breastfeeding increases a mother’s risk of breast and ovarian cancer and a baby’s risk of various infections, SIDS and obesity. So, does a breastfeeding mother’s diet have any effect on her breastmilk? There are some things we do know about how a mother’s diet can affect her breastmilk. 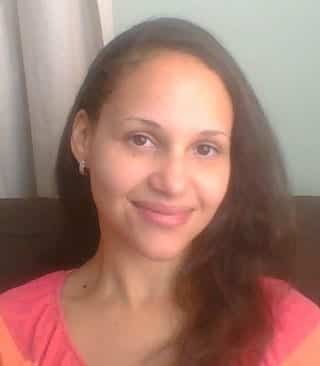 For example, if a mother is deficient in vitamins (e.g. vitamin B12) then her breastmilk is likely to be deficient, too. We also know that the types of fat she eats tend to match those found in her milk. Also, while it is likely that the quality of a mother’s diet will affect the types of probiotics (oligosaccharides) in her breastmilk, more research on this is needed. Is there any benefit to the images used in this campaign for breastfeeding? Images like those used in this campaign are simply not helpful. They can undermine a mother’s confidence in breastfeeding. There is simply no such thing as ‘poor quality’ breastmilk, especially if the alternative is non-human milk. Unfortunately and unnecessarily, the effect of this type of image is to influence some mothers to formula feed. Mothers who wish to breastfeed need support rather than discouragement. Although it’s natural, breastfeeding is a learned skill. As with learning all new skills, it can take some time to get the hang of it. Many mothers need all the knowledgeable and empathetic support they can get in order to get breastfeeding working well. Most mothers (96%) start out by breastfeeding. Yet only about half are breastfeeding to any extent by the time their babies are 6 months old. Let’s focus on real ways to help boost breastfeeding rates, rather than potentially reduce them with images like the ones used in this campaign. Formula companies revel in ‘informing’ women they need a good diet to breastfeed. They even tell them so on their formula tins. They are looking for as many reasons as possible to persuade more mothers to buy their product. If a mother’s diet is poor, she might feel inclined to switch to formula, thinking her diet is harming her baby. Interestingly, it has been reported that Brazil’s SPRS is sponsored by Nestle (a large formula company). When corporate money is invested into an organisation it creates a conflict of interest – especially on an issue like formula and breastfeeding education. See a comparison of the ingredients in breastmilk and formula. You’ll be surprised at what babies actually get when they breastfeed. Being a mother can be hard. There is no such thing as the ‘perfect’ mother or the ‘perfect’ diet. 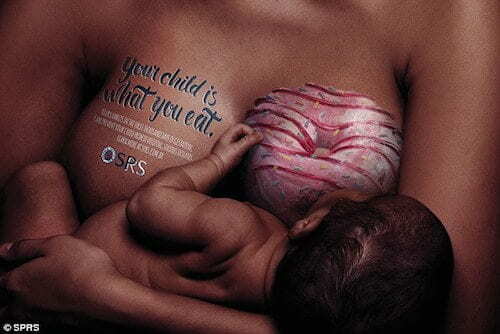 If you breastfeed, don’t let images like those used in this campaign, or messages on formula tins, deter you. Seek reputable information from sources that utilise evidence-based practice and information to support mothers, such as the Australian Breastfeeding Association or La Leche League.